The Britax Pinnacle G1.1 is one of the top multitasker players on the booster seat team. It’s actually a combo forward-facing harness seat and booster seat. With the highest weight and height limits of any other booster on the market, it should be able to fulfill its roll from the time your child is too big for rear-facing and until he no longer needs a booster. The Pinnacle is the top tier of a triad of similar booster seats from Britax, including the Pioneer and the Frontier. Premium seats like the Pinnacle come with a premium price, but from the sturdy construction, excellent side impact protection and easy installation, it’s most likely a great investment. But have a look at our review before you make a commitment. We’ve broken down all the stats for you in one convenient place. Though there are 3 recline positions in forward-facing harness mode, some parents reported their child’s head slumped forward, which made it uncomfortable while sleeping. However, it is not clear whether they were using forward-facing or booster mode. There is NO recline when used as a booster. When reclining for forward-facing, it must be done BEFORE installing. Once it’s installed, it won’t budge for reclining. This is one feature we hope they improve upon. The good thing is you don’t have to remove the seat from the vehicle completely to adjust the recline or to convert to booster mode. Note: There is an alternate version called the Pinnacle ClickTight Cool Flow, which comes in two different colors: Grey and Teal. It’s slightly more expensive, and includes Cool Flow ventilated mesh fabric to improve air circulation and keep your child cooler. This might be a great option if you’re in a hot climate. What are the child size limits of the Britax Pinnacle G1.1 ClickTight? Most parents had no issues whatsoever with how their child fit in the seat. However, if your child is really tall for his/her age, it’s possible they will outgrow the height limit before the weight limit. So be sure to keep track of their growth and refer to the user manual to ensure they’re still within the size range. Note: The seat back cannot be removed to convert to a backless booster. How big is the Britax Pinnacle G1.1 ClickTight, and will it fit in your vehicle? Make no mistake – this seat is big and heavy. This is not a good option if you need to frequently transfer the seat from one car to another. You’d be better off buying 2 of these seats or opting for a lighter model. If you want to install 3 car seats, it’s pretty much impossible with the Pinnacle. If you have a really big van or SUV, be sure to take measurements first to see if it’s a possibility. Trying a display model from a local store would also give you a good sense of how this seat will fit in your vehicle. The limiting factor will be the shoulder/headrest. Due to the thick side impact protection cushions, it’ll be a tight fit with more than one seat, regardless. But for great side-impact protection, that’s not really a bad thing. Note: If your vehicle headrest keeps the car seat from sitting flush against the back of the vehicle seat, you will need to adjust or remove the headrest. 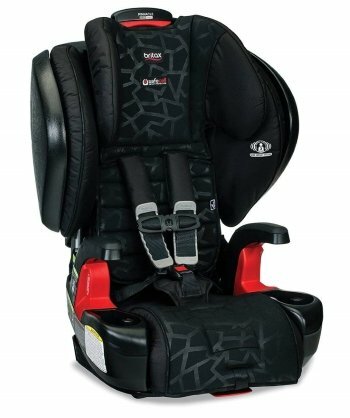 How safe is the Britax Pinnacle G1.1 ClickTight? In this model, Britax has included their patented SICT (Side Impact Cushion Technology). These energy-absorbing cushions are meant to protect not only the child in the seat, but anyone sitting next to the seat as well. It works by expelling air through special vents, thereby absorbing energy when the cushions are compressed in a crash. According to Britax, the SICT can reduce side-impact forces by 45%. However, this number seems to be mentioned only on their Canadian site as far as we can tell. There are no side-impact standards for car seats in the US. So it’s unclear whether the 45% is in comparison to other Canadian Britax seats or a general calculation in comparison to other brands. Car seat base with SafeCell technology – Constructed with both a steel and plastic frame. It both stabilizes the seat and absorbs energy in an impact. Headrest – Several layers for energy absorption, cushioning, and support. The large wings can also help deflect flying debris from a crash. Tether – Impact-absorbing with a V-shaped patented design. The tether both helps to prevent seat rotation and has stage-released stitching to reduce forward movement (rebound) of the seat in a crash. It’s required when your child reaches 65 pounds but can and should be used all the time if possible. LATCH – Can be used in harness mode up to 38 pounds, and also can be used in booster mode as long as it won’t hinder the seat belt path, but check your vehicle owner’s manual to make sure it’s allowed. A few parents reported difficulty in tightening the harness while the seat is installed. It’s possible the vehicle seat’s design can play a factor with this. Vehicle seats with a very straight back may press against the harness and cause it to catch when tightening. Vehicle seats with more of a sloping back could allow more room for the harness to move when you adjust it. Note: There are no known recalls for the Pinnacle. How easy is it to install and use the Britax Pinnacle G1.1 ClickTight? The majority of parents agree that installation with the ClickTight system is super easy, which is good, because they also agree that it’s a heavy, bulky seat. But they were okay with sacrificing the space in the back seat because they felt the seat was extremely sturdy and safe. Several parents, as we mentioned above, had trouble getting the harness tight enough. If this happens, Britax has suggested (for the Frontier model) inserting a thin MDF or cutting board between the car seat and vehicle seat’s back. This could also be a good solution for the Pinnacle if you experience this. If you’re used to the ClickTight panel (or even if you’re new to the Britax brand), you should have no issues with LATCH or vehicle belt installation. The LATCH straps are a simple push and click onto your car’s lower anchors. There are green stickers to indicate the correct belt path for vehicle belt installation. The ones on the side are a little harder to interpret, but once you find them, it’ll be easy from there on out. When converting from harness to booster, you don’t have to remove the harness, although you can if you wish. There are pockets built into the fabric of the side wings so you can tuck the harness away when not using it. Expert tip: Unlike older seats, you don’t need to pull all the slack from your vehicle belt before closing the ClickTight panel. It actually won’t work properly if you do that. So leave more slack than you normally would. The panel acts as a lockoff device for the vehicle belt. Try one of these add-ons for a more comfortable and enjoyable ride. Store your child’s books, toys, snacks and mobile devices in this handy organizer that slips over the back of the front seat. The clear viewing panel keeps their devices safe and clean and is touch-sensitive! No more falling asleep and dropping the iPad in the car on those long trips. Keep your car seat clean and safe during flights and when storing with this water-resistant bag that fits all Britax seats. There are backpack straps and several carry handle for easy transport. It even has a luggage ID holder, wheels and a sturdy rubber base. If you’re moving from a rear-facing infant seat to forward-facing, you should definitely consider this seat. 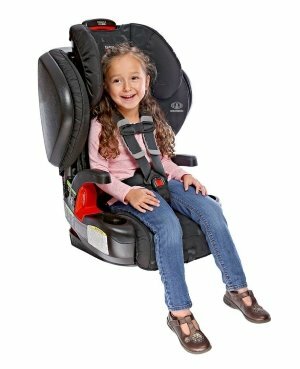 It will likely last until your child’s out of both the harness and booster seat, which could save you money in the long run. It’s not cheap, but the safety features make it a great investment. If you’re in a hot climate, consider the “Cool Flow” fabric options. For those who need to frequently switch seats between cars or if you need a 3 car seat configuration, you’d be better off with a lighter, more compact model. This is a big, heavy seat meant to be installed and left where it is. However, when you need to uninstall and move it to another vehicle, you should have no problems since the installation is so quick and easy. Though some parents had issues with tightening the harness straps, this can be due to the design of your vehicle seats. Adding a piece of thin MDF or cutting board between the back of the car seat and vehicle seat could help with this. However, if you can try one out from a local store or a friend, we highly recommend doing so before you buy just to save yourself some frustration in case it’s not a great fit. But if you have any issues, Britax has good customer service and will be happy to help you. Due to difficulty in tightening the harness, my wife and I find this seat to be unsafe for daily use. We purchased 2 of these seats for our 4 year old twins. The purchase was based on the safety/ user ratings of the seats and the ease of installation. The GOOD: Clicktight works great to get the seats into the car. The seat is well padded and seems very safe, at least in terms of the build. The BAD: the harness simply will not tighten when the strap is pulled from the bottom of the seat. My 5’1″, 110 lb wife told me she could not tighten the harness without climbing into our van, putting her feet on the seat and leaning back with all her strength. I didnt believe that, so being 6’2″ 225 lbs, military trained, I tried to tighten the harness and had the same problem. There is really no possible way to tighten the harness with arm strength alone. No way. Considering that both of our Pinnacle seats have this same problem, I doubt that I have a defective seats. I contacted Britax who was responsive. They said to take the seats out, go to Home Depot and purchase a thin piece of laminate wood for between the car seat and the van seat. I did that and there was NO improvement. Just another $40 wasted money trying to make these seats work. Realizing that the seats were completely unusable with the loose harness, we removed them and went back our original forward facing, non-booster seats. I cannot for the life of me see how these seats get good reviews! Ours which are only 2 months old sit in the corner of our garage unused. We dont feel right about reselling them or even giving them away with this flaw in the strap mechanism. Hi Mike, thanks for your comment. We are so sorry to hear that your seats didn’t work for you. We have discovered that these seats may not be compatible with all vehicle seat designs. For instance, as we reported in our review, vehicle seats with a very straight back may press against the harness and cause it to catch when tightening. Vehicle seats with more of a sloping back could allow more room for the harness to move when you adjust it. This may or may not be causing your issue, but many parents have had a good experience with this seat. If you cannot get the harnesses tight enough, however, and you’ve tried everything, by all means, don’t use the seats. You should only use car seats that you feel will best protect your children.